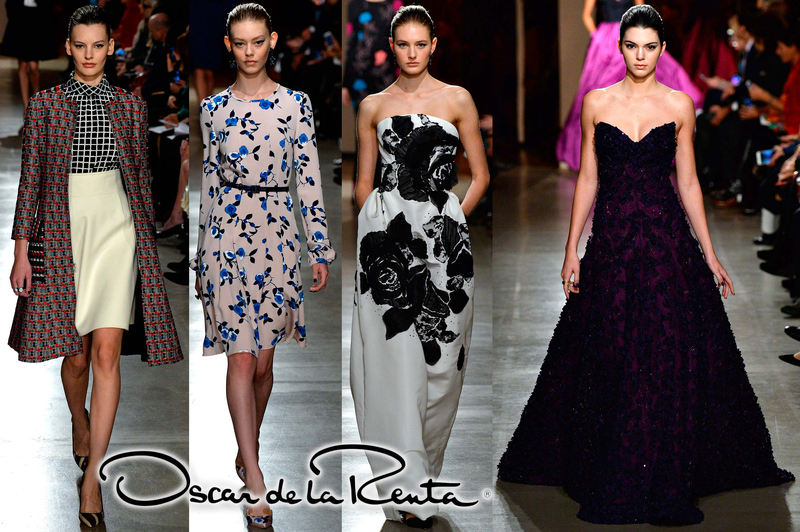 Runway Rundown: Oscar de la Renta’s Fall 2015 Ready-To-Wear Collection from #NYFW! In the first collection from the house of Oscar de la Renta since the legendary designer’s death last October, the essence of the brand’s legacy was reincarnated on the runway during New York Fashion Week. de la Renta’s successor, Peter Copping, paid homage to the fashion house with an acute eye for color in burgundy, navy, purple, & chartreuse. Also, the line featured a sophisticated mix of daytime separates, coatdresses, & classic ballgowns that would perfectly suit the upcoming red carpet at this weekend’s Academy Awards. In support, celebrities who gathered in the front row were “Style” singer Taylor Swift with model bestie Karlie Kloss, as well as the esteemed likes of Barbara Walters. Also, walking in the show was none other than runway darling, Kendall Jenner, who was flawless in one of the major statement gowns, featured above. Do you think Copping’s debut for Oscar de la Renta honored the label? Which looks were your favorites? For more from Runway Rundown, check out more fashion week galleries including Delpozo, Marchesa, Valentino, Giambattista Valli, Alexandre Vauthier, Viktor & Rolf, & Elie Saab. Happy Styling! This entry was posted in Runway Rundown, Style Darling Daily, Watch This Style and tagged designer, fashion, Fashion Week, Karlie Kloss, Kendall Jenner, New York Fashion Week, NYFW, Oscar de la Renta, runway, runway rundown, style, Style Darling Daily, style for days, Taylor Swift. Bookmark the permalink. ← Runway Rundown: Marchesa’s Fall 2015 Ready-To-Wear Collection from #NYFW!